Cancer biomarkers are substances indicate that tumor state, progression characteristics, and response to therapies. Most cancer biomarkers are transcription factors, cell surface receptors, or secreted proteins that are produced by either cancer cells or other cells in response to cancer. Von Hippel-Lindau (VHL) disease is a cancer syndrome that is hereditary and affects 1 in 35,000 people. VHL disease is characterized by central nervous system, retinal, kidney, and adrenal gland tumors. Conducting research on VHL disease can be a complicated process; the gene for VHL is expressed in organs throughout the body, not only in those organs affected by the disease. Patients with VHL are heterozygotes and carry one wild-type and one inactivated VHL allele. VHL gene mutations can be difficult to identify, but more recent diagnostic techniques, such as direct DNA sequencing, Southern blotting, and fluorescence in situ hybridization (FISH), have improved VHL mutation detection. Twenty to 37% of patients with VHL have germline delections, while approximately 23 to 27% have frameshift or nonsense mutations and 30 to 38% have missense mutations. More than 150 germline mutations of the VHL gene have been identified and linked to VHL disease. Genotype-phenotype correlations have also been identified in VHL disease research. Type 1 VHL families have an absence of adrenal gland tumors and frequently have VHL deletions or truncation mutations. Type 2 VHL families have adrenal gland tumors and frequently have VHL missense mutations. Scientists believe that the genotype-phenotype correlations illustrate the VHL gene product’s alteration by various VHL mutations. VHL is also associated with an increased risk or renal, or kidney, cell carcinoma. Familial pheochromocytoma is another feature of the VHL disease, and has also been determined to be associated with germline inactivating mutations. Somatic VHL mutations and hypertmethylation appears in approximately 50% and 10-20% of sporadic clear-cell renal carcinomas, respectively. However, VHL germline mutations rarely appear in patients with sporadic clear-cell renal carcinomas. VHL mRNA encodes a protein, pVHL, which travels between the nucleus and cytoplasm. Researchers have discovered that pVHL lacking cells overproduce hypoxia-inducible RNAS. Vascular endothelial growth factor (VEGF) mRNA is a hypoxia-inducible RNA and is often overproduced by tumors associated with VHL inactivation. Many genes that are regulated by hypoxia, including VEGF, are controlled by hypoxia-inducible factor (HIF), a transcription factor. It has been shown that pVHL lacking cells do not degrade HIF subunits in the presence of oxygen. Scientists thereby determined that pVHL is a ubiquitin ligase that controls the degradation of HIF subunits in the presence of oxygen. The pVHL and HIF interaction is mediated by a conserved family of Egl-nine (EGLN) enzymes that cause a post-translational hydroxylation of HIF when oxygen is present. 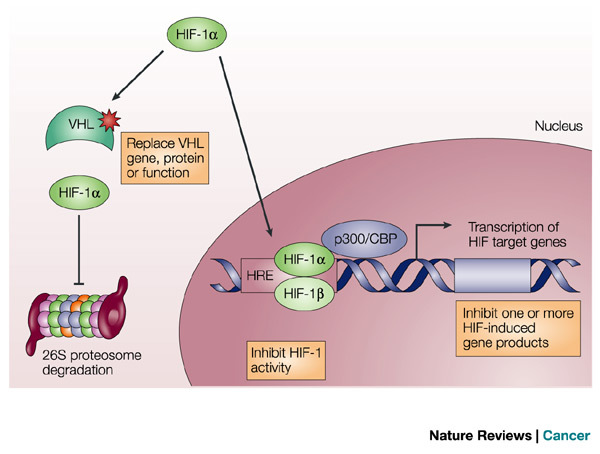 Without pVHL present, HIF is stabilized and can induce gene expression; many of HIF’s target genes are critical to the human body and regulate functions such as angiogenesis, cell growth, and cell survival. Researchers also hypothesize that overexpression of HIF target genes, such as platelet derived growth factor (PDGF) and VEGF, are responsible for the hypervascularity of tumors. Additional preliminary data suggest that HIF maintains a role in the formation of pVHL defective tumors. Thus, HIF is a viable target for therapeutic research. Testing inhibitors of HIF controlled growth factors could develop potential treatments for renal cell carcinomas and central nervous system tumors. Throughout the world, endometrial cancer is the fifth most commonly diagnosed cancer in women. Approximately 34,000 new cases of endometrial cancer appear each year and it is the most commonly diagnosed gynecological cancer. However, not much is known about the genetics of endometrial cancer. Researchers have shown that PTEN, TPS3 and KRAS2 gene mutations are the most common mutations in endometrial cancer, but approximately 20% of uterine endometrium cancer exhibit MSI, also known as microsatellite instability. MSI is the instability of sequence repeats throughout an entire genome and is correlated with defective repair of DNA mismatches. MSI is commonly found in patients’ tumors with hereditary non-polyposis colorectal cancer (HNPCC) and is found in higher frequency in endometrial cancer than any other common type of cancer. Most patients with hereditary non-polyposis colorectal cancer have mutations in their MLH1 or MSH2 mismatch repair genes. However, mismatch repair gene mutations are not commonly found in sporadic cancer. Other researchers have demonstrated a correlation between MSI-positive cancer and a lack of detectable levels of MLH1 and/or MSH2 mismatch repair genes. Another group of scientists has demonstrated that MLH1 promoter methylation to be associated with MSI with primary cancer. In primary colon cancer, the methylation of the MLH1 promoter and the presence of MSI were correlated with the absence of MLH1 expression. Sally Simpkins and other scientists at Washington University School of Medicine and Thomas Jefferson University have also found a strong correlation between MSI-positive endometrial cancer tumors and MLH1 methylation. In their research study, the MLH1 promoter was methylated in 77% of the MSI-positive endometrial tumors. Out of the 11 MSI-negative tumors, 10 tumors exhibited MLH1 unmethylation. The correlation between the MSI-positive endometrial tumors and methylation was found to be statistically significant. Researchers also found all of the MSI-negative tumors to express MLH1 and MSH2 and all of the MSI-positive tumors failed to express either MLH1 or MSH2. While methylation was correlated to the presence of MSI, 86% of MSI-positive tumors also exhibited abnormal MLH1 expression. 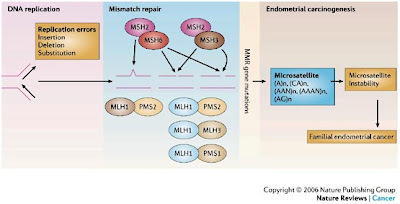 Simpkins and colleagues suggest that the correlation found between MSI, MLH1 expression, and MLH1 promoter methylation shows that MLH1 plays an important role in the development of endometrial tumors. However, this research is in direct contrast to some other studies. The scientists do agree, however, that epigenetic gene silencing is most likely responsible for the defective repair of DNA mismatches reported in most endometrial cancer. Another interesting conclusion from Simpkins’s research study is that inherited cases of endometrial cancer may be correlated with the lack of MLH1 methylation and MSH2 expression. Based on the results, it appears that MSH2 appears to affect inherited endometrial cancer and MLH1 defects account for sporadic endometrial cancers. However, more research needs to be conducted on the role of genetics in inherited endometrial cancer suspectibility. The correlations found between MSI-positive tumors and MLH1 expression, MLH1 promoter methylation, and MSH2 expression provides a potential target for cancer therapy research. Scientists could possibly design a product that could affect the expression of MLH1 or MSH2, or unmethylate MLH1. The difference found in sporadic and hereditary endometrial cancer from the two mismatch repair genes, MLH1 and MSH2, is also critical to future research in cancer therapy. This suggests that tailored therapy would need to be implemented, and that one therapy might work for one patient with sporadic cancer, but not for another patient with hereditary endometrial cancer.